Since 2010 Home Grown Fun has inspired people around the world to explore nature and have more fun in the garden. See our site in PICTURES! Visit our new FORUMS PAGE where people from around the world share their tips! Check out our Digital Store for amazing eBooks, fun downloads and unique learning materials. Some for FREE! You will love our latest project! Over a year ago my daughter created this terrarium and only opened it once so far in the very beginning to add a tiny bit of water! We haven’t added any water since the week we created it in Oct 2017! Any size jar will do. Imagine one of these 3 feet tall – where can I get a glass vessel that big? This is an exciting project for all ages, especially when you’re stuck inside for an hour. It’s educational and fascinating. 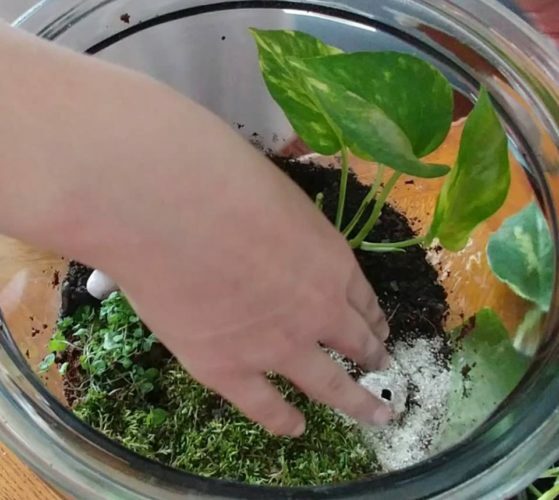 Learn about the water cycle and discover changes in your homemade ecosystem as time goes on. There’s little maintenance. Just pay attention to location. We have ours out of direct sunlight. If you see yours is dying due to lack of moisture, crack the top and add a few spoons of water. Once it starts to fog up and then clear up on its own, you’re on the right track and you can leave it. Stop yourself from opening the top! This was on the floor until today and it survived a move LOL. Homemade terrariums featuring plants, rocks and soil give you instant satisfaction and long-lasting interest! Imagine a mysterious, misty land that develops its own personality and ecosystem over many years! Terrariums are educational, fascinating and one-of-a-kind. And they require little to no maintenance! 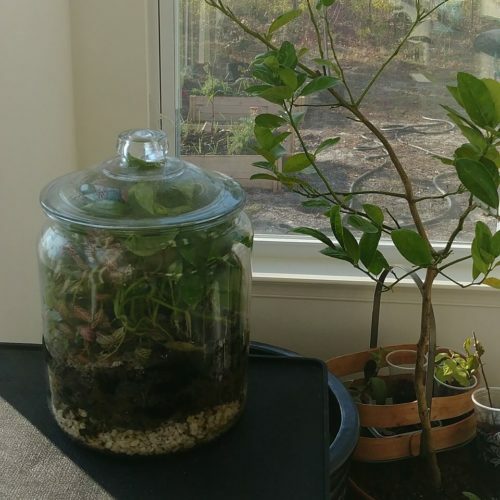 Is it easy to create an enclosed terrarium? Yes, all it takes is a container, rocks, screening, charcoal, soil and one or more plants. 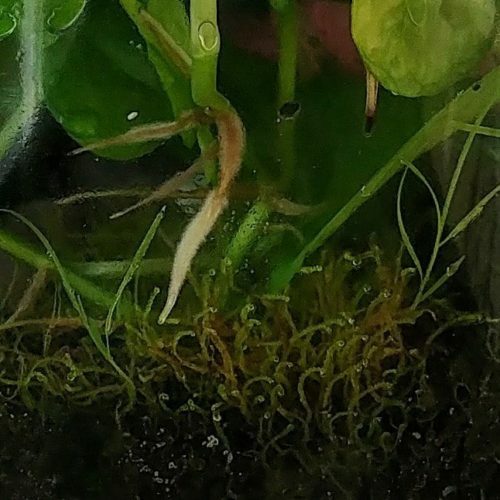 The Golden Rule of terrarium materials: Make sure your materials are clean and the plants you choose are disease free. Plastic or glass container – something you can easily see into and has a lid that seals well. 1/4 cup to 10 cups small rocks – small for the bottom of the container and a few for show. 1 -5 tablespoons of charcoal – the kind you would add to a fish tank. Screen mesh cut into a shape that will fit inside the bottom of your container – the kind you use to make a window screen. Enough soil to fill the container 1-4 inches deep – new potting soil free of insects and debris. 1-3 plants – plants that like moisture and tend to stay fairly small. No succulents (they will die in humid, closed conditions. If your container is small, use one plant. Make sure your container has a cover that keeps air out and moisture in. The water inside the container will evaporate, rise and seep through the soil and rocks non-stop. You do want to be able to open the top if necessary so do not plan to seal the container permanently. BUILD THE BASE: Gather your materials and layer the bottom of the container with an inch or two of small rock, a tablespoon of charcoal and the screening material in that order. You can cut the screen to be slightly smaller than the circumference of the container so that the edges won’t show. ADD THE SOIL: Thoroughly moisten the soil first in a bowl: VERY IMPORTANT! Add soil at a depth using the guide below. The goal is to ensure you have enough soil for the plant to thrive. Be generous, even if that means the soil takes up a bit more space in your container. Add rocks, charcoal, screen and soil. Then add plants and other fun stuff. 3. PLANT: Insert your plants into the soil, making sure the surface of each plant’s original root ball is even with the new soil. 4. ADD ACCESSORIES: Add embellishments like fossils, rocks, gems or even fairy houses, etc. 5. SEAL: Place the top onto the container and locate your container OUT OF DIRECT SUNLIGHT. 6. MONITOR: Check on your terrarium every day for a week. For a sealed terrarium, you want the climate inside the container to develop its own weather patterns. Water should “rain” and drain and do it all over again. All without your help. If after several days you notice it clouds up and never clears up, crack the top for a few hours to let some moisture out. If it never seems to get cloudy or foggy, add a tiny bit of water (1-6 tablespoons depending on the size of your container). Then seal it back up and watch it for another week. Refrain from opening the top once the environment looks ok. Let it develop its own climate over time.